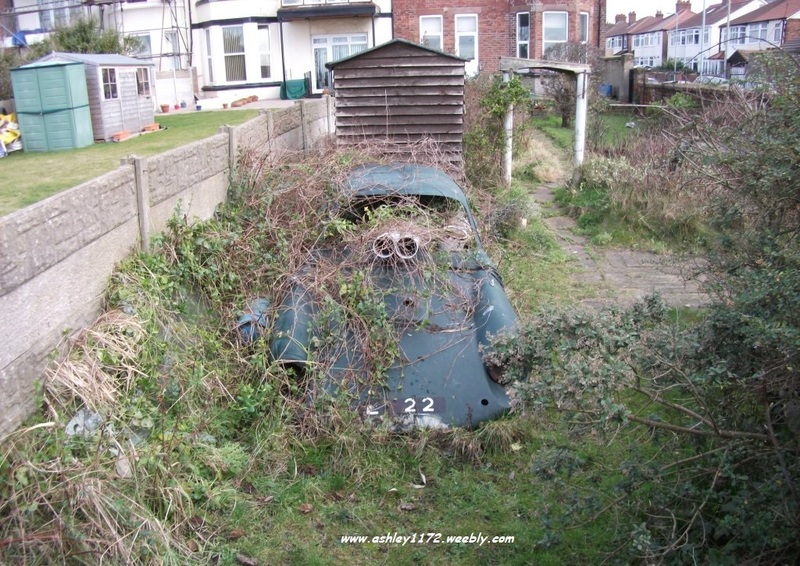 This is all that remains of the Ashley 1172 registered as MEP 22 in Monytgomery, Powys, Wales in October 1960 by M.E. Preston. Fits 90 inch wheelbase Ford Popular, Anglia, etc. rolling chassis. Only 9 known to exist Worldwide; so very rare opportunity. I contacted Steve via eBay email asking for anymore details about the origins of the shell. I am not sure what MEP 22 was when it arrived in Waterloo, Liverpool about 30 plus years ago. The story is that the owner bought it to restore in his retirement, but had a heart attack and never got round to restoring it. It was registered by M E Poston, Hotel Garage, Montgomery in Powys, Wales on 6th Oct 1960, and is recorded on their register as a Ford Saloon. Neighbours told me it was on a Triumph Herald when it arrived in Waterloo, which may account for it having two holes hacked into the bonnet. I remember it as a wreck in the garden, and it has taken me the thirty years to acquire it, basically to see it salvaged. 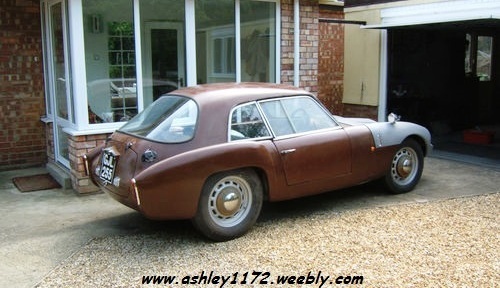 I have restored the shell to a reasonable standard, but it now needs someone to finish it and get it registered. There is no point in me doing this as I have too many cars and some must go . p.s. The original chassis was recorded as MP 1001 ( M. Poston ?) and engine C698128R which is a side valve Ford. (This engine No. is from a Ford Prefect E493A 1172cc in December 1952). A look at the old eBay advert shows that the Ashley 1172 bodyshell was sold so I will try and find out more so the story can be continued. but have found further info on the new Ashley 1172 bodyshell owner. I recontacted Steve last August/September time and he updated me with the details and photo's, shown below, of how he came to have the bodyshell and the work he has done on it since he acquired it. It was about this time that I was following up another Ashley 1172 car that had also been auctioned on eBay in May 2013 and Mike, the guy that sold it, gave me his buyers details, whose name is Phil. Phil it seems has a flair for collecting cars and other vehicles, which sounds a familiar addiction, and his latest additions were the Ashley that Mike sold him and a bodyshell that he had recently purchased on eBay. and Phil had more photo's and history about it's origins and past. I have some info that I will scan and email to you tomorrow, but the shell was bought form Stephen in Merseyside. M.E.Preston who hailed from Hotel Garage, Monytgomery, Powys, Wales. The registration number was MEP 22 (now that would be worth a pretty penny if it was still about wouldn’t it!) and the Chassis number was given as MP 1001, the engine number C698128R. I understand that Stephen spoke to the grandson at the garage but he could offer no real assistance. I have a couple of pages of pictures showing the shell in a garden, heavily grown over which I will let you have and it was in that state when Stephen bought it. 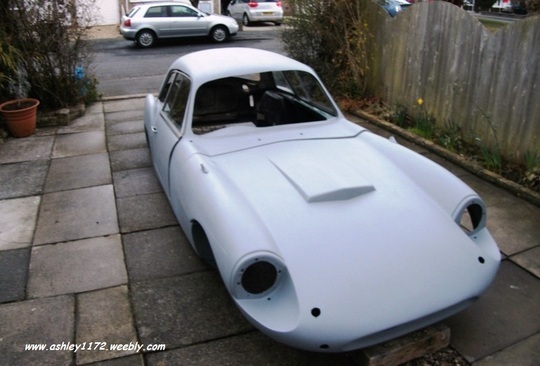 The photo's show Steve's, over the garden wall snap's, in a snow covered overgrown neighbours garden, then a couple more without the snow, finishing with 3 of the rescued Ashley bodyshell back in his own backyard before he stated restoring the fibreglass shell.